Just as in previous years, the first warm days of Spring bring out the closet gardener in every Australian and for a brief few months my fellow-countrymen flirt with the joys of planting – tomatoes, mostly. This harmless national insanity tends to peter out just after Christmas when the hot weather really sets in. Nevertheless, its now that the plant nurseries are clogged with enthusiastic gardening neophytes buying big on tomato seedlings raised over winter in heated glasshouses, and us old chaps doing it the hard way – growing tomatoes from seed out in the Spring sunshine - are over-run by the wannabes racing for home-grown tomatoes on the table by Christmas Day. “Very few of you will know this, but Thomas Alva Edison - the inventor of such things as light bulbs and the gramophone - was a closet gardener! He deceived the general public into thinking that, in the following statements to the press, he was talking about inventing. In fact, it was all in code, as he was really explaining his experiences of life to the cognoscenti of the ‘Perfect Tomato Club’. "To invent a new type of tomato frame, you need a good imagination and a pile of junk." "The opportunity to grow the perfect tomato is missed by most people because it is dressed in grubby clothes and looks like work"
"Gardening is one-percent inspiration and ninety-nine percent perspiration"
"I haven't failed to grow the perfect tomato, I've found 10,000 ways that don't work"
"Good tomatoes are what happen when opportunity meets with planning"
"I never failed once. Growing the perfect tomato just happened to be a 2000-step process"
"I never did a day's work in my life. It was all fun"
"Nearly every man who wants to develop the prefect tomato works it up to the point where it looks impossible, and then he gets discouraged. That's not the place to become discouraged." 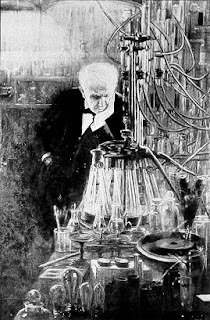 In summary then, old Tom (short for 'Tomato') Edison was a crusty old bloke who never ever gave up (witness his indefatigable efforts to create the light bulb), and he didn't mind calling a spade a shovel. All those quotes actually came from him but, of course, he let his landlady grow the tomatoes, as he was known to sleep on a cot under the stairs down at the lab. Yep, I'm lucky to have such a big piece of land behind my house though, in truth, I chose the house because it had the land - it was no accident. Maybe there's a community garden near you that can lease you a small plot on an annual basis, where you can meet other gardeners and pick up tips and tricks? Food is fun when you've grown it yourself - it's a very rewarding pastime.